Today I rented a lovely little Nissan Versa and drove to San Jose to view the Winchester Mystery House. This house seems very creepy on TV shows, but having now toured it and learning more about Sarah Winchester, I think the mystery of the house has dissipated. It’s a very lovely place — full of Tiffany stained glass and beautiful sculpted woodwork. It was very interesting to see rooms that had been damaged by the 1906 earthquake and never fixed (Sarah Winchester decided after the earthquake that she hadn’t been spending enough time working on the rest of the house and had those rooms closed off and never used again). I also took the “behind the scenes” tour (too bad I didn’t get a photo with my hard-hat), which took me through an aviary, and into the boiler room and an unfinished ballroom, among other places. That house is really gigantic. 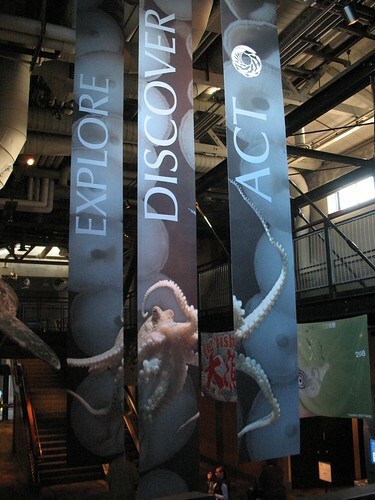 I decided to drive further south to Monterey so I could see more fish and aquatic animals at the Monterey Bay Aquarium. I had planned to finally eat whole crab for dinner tonight, but I had a long drive from Monterey back to San Francisco so I went to the first place on the Cannery Row that sounded good: Louie Linguini’s. It was a lovely little restaurant with a lot of fun photos and fictional news clippings, but I wish I had waited for crab (just for the experience). I made the long drive back to San Francisco in the dark. It was just a little nerve-wracking with the hills just south of San Jose and the scary biker gang just south of San Francisco. But I had one reminder (from a grumpy taxi driver) in my mind: “Van Ness, Van Ness — Just remember: Van Ness!” Van Ness Avenue will get you to some very important sights in San Francisco, such as the Golden Gate Bridge. I’m not sure why, but driving over the Golden Gate Bridge was nearly panic-worthy. I figured I had better just do it, though, so I could say I’ve done it. I took a little break at the vista point on the north side of the bridge, but then kept moving. 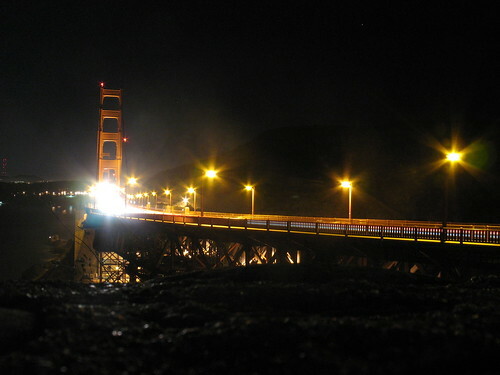 I made a quick drive through Sausalito at night (I think everyone had gone to bed), then back over the bridge. I decided to drive up a very steep hill, then I drove down a very steep hill, and then I was very much done driving in San Francisco.